I don't lose important items like my laptop, my table or my smartphone. But in my personal life, I am surrounded by people who misplace their stuff, (and other critically important items like house keys and car keys.) When these unnamed people go crazy looking for these lost possessions, they stress me out. 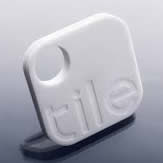 Tile will start shipping this coming winter, but you can preorder Tiles via Amazon.com at a cost of $18.95 per individual Tile. Once the company starts to ship, the Tiles will retail for $25.00. It's the perfect Christmas/Hannukah/Kwanzaa/birthday gift for your errant children.